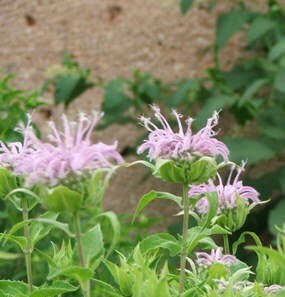 Bee Balm is a member of the mint family. What we think of as showy lavender flowers are really the purplish bracts. These flowers attract bees (especially bumble bees) and butterflies when they bloom in May, June and July. The aromatic leaves are also used in teas; in fact, another common name for the Bee Balm is Oswego tea. Bee Balm is one of the hosts for the Hermit Sphinx moth. This caterpillar is described as he 'black knight' of caterpillars. Both the caterpillar and the moth are chocolate brown with black markings.